Babies are born in all kinds of settings, but a 24-year-old woman in Berlin chose to have her third child in December of 2010 inside a magnetic resonance imaging device at the Charite University Hospital in the German capital. Researchers at the hospital last month released a brief segment of the seven sequences of real-time images they made of the birth inside a specially constructed open MRI, shown in the photo below. The video accompanied the publication of their article about the event in the American Journal of Obstetrics and Gynecology. A midwife, an obstetrician, a neonatologist and an anesthetist were in the magnet room while the MRI was on. The hospital's delivery unit was a short distance away on the same floor. Mom and baby left the hospital two days after participating in this historic birth. The view of the baby's journey into the world from inside the birth canal will provide researchers with valuable insight into the mechanics of this amazing passage, the authors said. The mother was just shy of 38 weeks gestation, fully dilated and experiencing regular contractions. She received an epidural before entering the MRI, where she remained for less than an hour, according to the article. One additional "study" was taken of the mother's body after birth, "to evaluate the third stage of labor with regard to placental separation and uterus involution," the authors wrote. 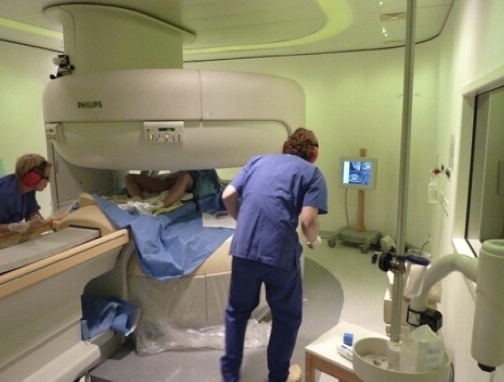 The researchers, all affiliated with Charite, were concerned about subjecting a brand-new baby to the loud noise of the machine without the "maternal soft tissue" padding, so they turned the MRI off just at birth. Prince William, set to marry on Friday, was born in the private Lindo Wing of St. Mary's Hospital in London on June 21, 1982, more than a week before his due date. He was the first male of the British royal family to be born in a hospital. Prince Charles also broke with tradition by attending the birth. Prince Charles and his first wife, Princess Diana, William's mother, arrived at the hospital very early on the morning of the day William was born. George Pinker MD, the royal gynecologist, attended Diana. She had also been coached by Betty Parsons, a nurse and natural-birth advocate who had helped Queen Elizabeth with a couple of her births. Many accounts present the birth as "natural" and drug-free, while at least one insider book holds that the princess had an epidural during her 16-hour labor. William was born at 9:03 p.m., and weighed 7 lb. 2 oz. A 41-gun salute was fired off in his honor. Princess Diana was back home the next day. Prince Charles, always restrained, was clearly thrilled. He wrote friends, "I can't tell you how excited and proud I am," adding that he found the newborn William "surprisingly appetising." 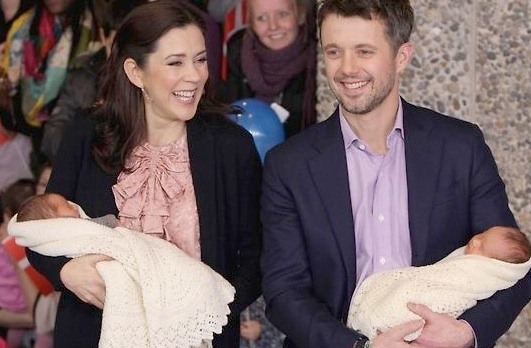 Frederik, the crown prince of Denmark, and his wife, Crown Princess Mary, brought their newborn twins home from Rigshospitalet in Copenhagen today. The boy and girl were born on Jan. 8. In the custom of Danish royalty, the babies will receive their names at their christening, which could be as long as three months from now. The birth started spontaneously and lasted about five hours, said Princess Mary’s obstetrician, Dr. Morten Hedegaard. The birth team also included midwife Birgitte Hillerup, who said the princess, 38, had an epidural for pain. Frederik attended the birth. The twins, along with older siblings Christian, 5, and Isabella, 3, are expected to visit their mother’s native Australia this year, perhaps for Christmas. The prince met the princess, nee Mary Donaldson, the Tasmanian-born daughter of a math professor, at a Sydney pub during the 2000 summer Olympics.